Faggotting? Never heard of the term before? It's an embroidery technique introduced sometime around 1920 to help seamstresses keep pace with the vagaries of Dame Fashion particularly the hem length. Okay. Faggotting is a decorative technique used to attach an extra stretch of fabric to the hem of a skirt or sleeve. 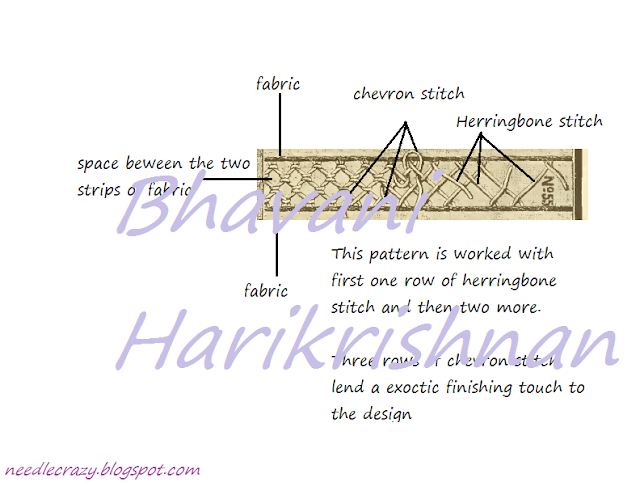 The purpose is either to add length to a garment or to attach two contrasting coloured fabric. It is sometimes both. Whatever the case, the result is very attractive and give the garment a delicate touch. Here's an example of this technique. I found this picture in an old embroidery book. You can download the book from here. The book has very few pages. But all the pictures are self-explanatory to an experienced needlewoman dabbling in various techniques. If you Google 'faggotting images', you'll get a fairly good idea of the practical applications of faggotting. There are about 5 faggotting techniques that I know of, including this one. I'll post tutorials of them soon.